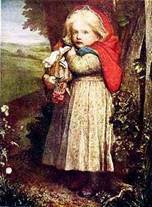 “Once upon a time there lived in a certain village a little country girl, the prettiest creature who was ever seen.” So began Charles Perrault’s tale. The story first appeared in 1697, and is still popular today. This very faded image appears so soft and gentle that unless we look closely, we’re apt to miss the warning signs. Sweet rosy cheeked Miss Red is all wide eyed innocence, even though the wolf has jaws like a great white shark, and could snap her head in one bite. The butterflies and flowers reinforce a false sense of bucolic serenity, while the enormous wolf stretches from border to border. It reminds me viewing the velvety tigers at the zoo. You’re so mesmerized by their beauty, it’s hard to remind yourself they’re master predators. 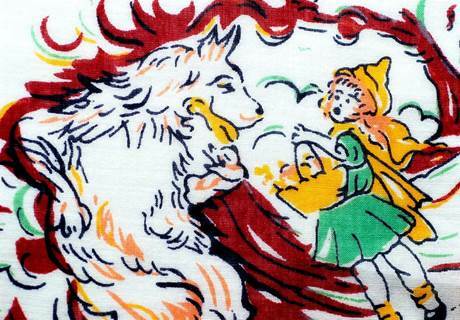 Note the artist highlights the wolf’s ears with yellow flames of caution. 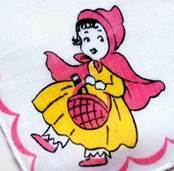 But Miss Hood is too guileless to see the signs. The more the image draws you in, the more you get that creepy feeling that crawls over you when watching a Hitchcock thriller. This pen and ink drawing employs a single color to underscore the theme of danger. Well done. 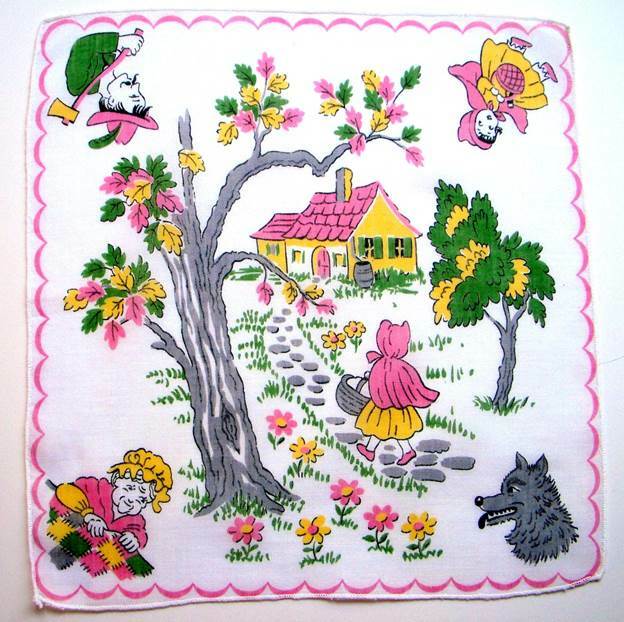 The fanciful border and soft leaves on the graceful tree have befuddled our young lass into believing she’s strolling through a friendly forest. Look again little Miss. The wolf is quadruple your capacity in every way. His rear haunches could spring into action and take you to the mat in seconds. The artist is a master of subtext. 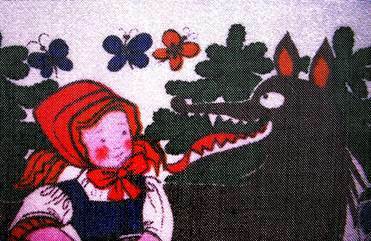 Yes, the wolf is smiling, but he’s simultaneously licking his chops. Our predator has been given the tail of a “fox” not a wolf. The message is clear; he’s a suave manipulator. And the red is not a childlike cherry hue. It’s blood red. Were you to bind a wound, this is the red that would be left on the cloth. Uh-oh. We’re in deep trouble. From her almost saccharine appearance – we know the deck is stacked. She’s about to become one tasty meal. 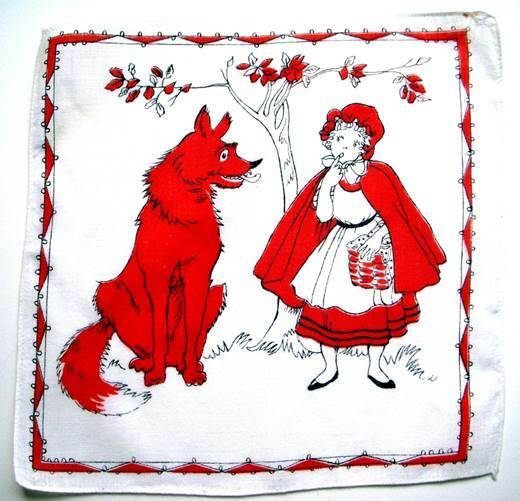 Offer him whatever is in your basket Red, and run, honey, RUN….. This sweet and innocent little granddaughter has thoughtfully stopped to pick a bouquet of wild flowers for grandma. Big mistake. It gave the slithering, slathering, slobbering wolf time to creep up and prepare to pounce. Sure hope that little bluebird in the tree is singing for help because those adorable Mary Janes are about as worthless as trying to sprint in a pair of Louboutins. We know it and the wolf knows it. Hopefully it will dawn on her to crack that bottle of wine over his skull. The artist did a nice job of reinforcing the image with a bright red border and little red socks. 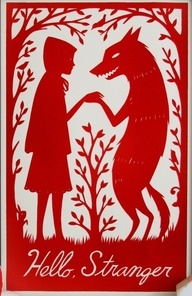 Too bad the wolf’s tongue is part of the tableau. Let’s hope for the best. This hand appliqued bad boy is my absolute favorite, right down to his wicked little toes. This wolf is so colorful, charismatic and come-hither that the artist, fearing for our safety, literally spells it out for us. But we can’t help ourselves. We want him. Who could resist? With his jaunty top hat, walking stick, and brass buttoned vest, this natty wolf is about as swanky and sassy as they come. 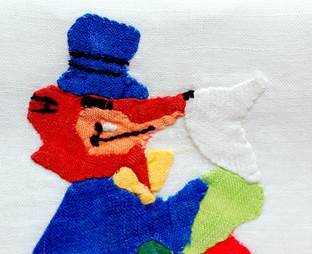 In addition to all the hand work that went into this, I LOVE the fact that he’s carrying a hankie! Then I wondered (dare I say it?) could this dapper devil be wiping a bit of gumbo à la Granny from his lips? Have we arrived too late to avert disaster? 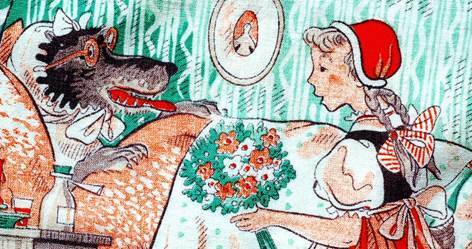 Upon closer inspection, it appears our rakish charmer has his hankie pressed to his cold wet snout. Thank heavens. Hopefully all is well and granny can make a dash for the door while our canny carnivore has his eyes squeezed shut mid-sneeze. Go granny! This hankie feels like a movie trailer of our tale. The story anchors center stage, while our cast of characters waits in the wings. 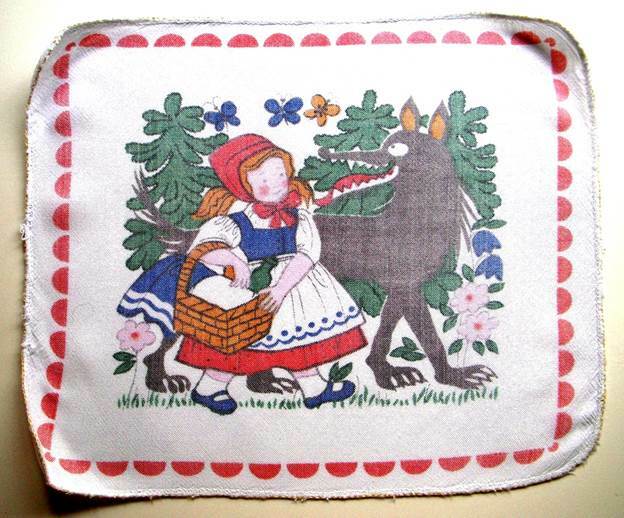 The wolf looks more like a hungry dog than a menacing canine with his cute little clown nose. This is the first time we’ve encountered the woodsman, who looks more like a sleepy Errol Flynn than a he-man, but that long handled ax should take care of the bad guys. Hmmmm. 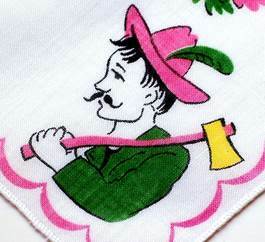 A pink handled ax? Did he borrow that from Barbie’s Dream Tool Shed? Methinks the pastel colors were carefully chosen to keep our story safe and sweet in fairy tale land. Miss Hood is just a few steps from granny’s friendly pink door and the entire scenario is bordered in soft pink scallops. Can there be any doubt they’ll all live happily ever after? 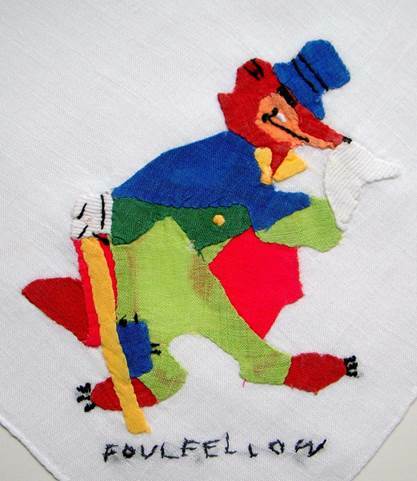 Pay close attention to the subtext of this hankie, where fear is conveyed through both image and color. The artist provides us with multiple illustrations in order to set up the story. 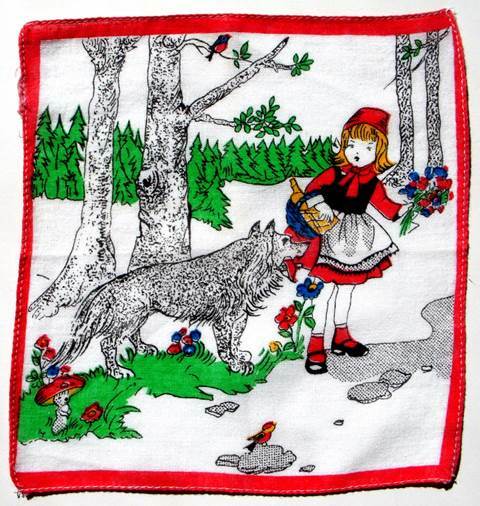 Before Red Riding Hood even encounters the wolf, she’s scared to death by a spikey, spooky owl.This is the first time we’ve seen her frightened. Good. At least she’s on her toes, so perhaps there’s hope for her survival. Yet she needs to get to granny’s, so on she trudges, only to encounter a wolf the size of a Kodiak bear. He anthropomorphically rests one paw on his hip, stroking his chin thoughtfully with the other, while squinting in quiet discernment of his prey. 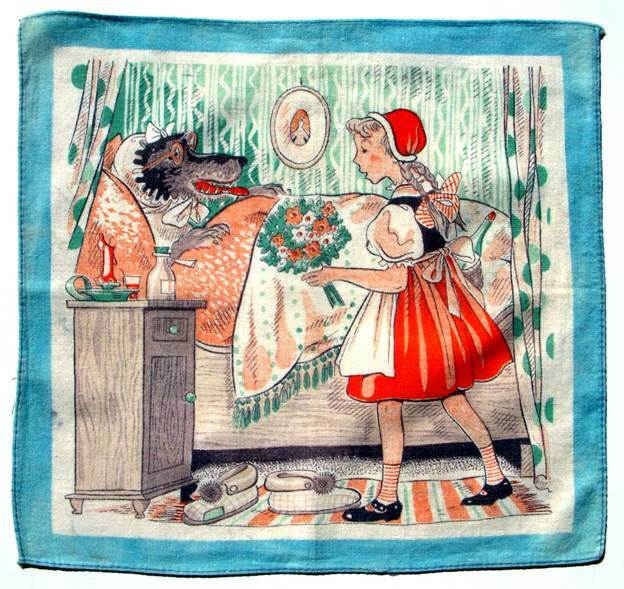 The gal in this hankie knows the score and she’s wise enough to place her basket of goodies between herself and this hulking monster. Thank you to the artist for that sweet touch of home. Like a light at the end of a tunnel, we see that safety is but a stone’s throw away. We hope, with all our might, our little girl can make it there. 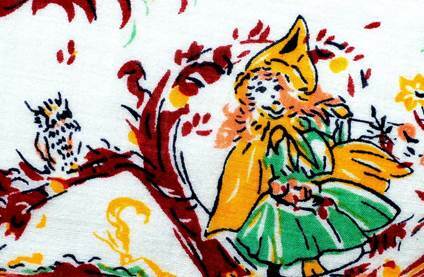 Unlike the other handkerchiefs, this heroine is depicted as both scared and savvy. If anyone can survive this debacle, she can. The clever use of yellow to frame the entire picture clues us in that this is cautionary tale on the benefits of fear – beats naivete and getting gobbled up. Here’s another Ms. Red we know will come out alright. She could block a Michael Jordon jump shot with those endlessly long legs. We know her escape will be swift and strong. 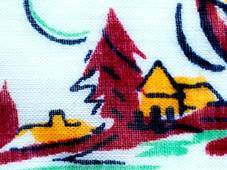 This is truly a charming hankie with a gazillion different patterns employed on the walls, rug, comforter, curtains, bed slippers and socks. Yet the salmon, turquoise, gray and green are so beautifully melded, the overall effect seems like a charming painting. Red’s braids, hair ribbons and crisp white pinafore, combined with a poufy feather bed curtained from drafts give the tableau a Scandinavian feel. 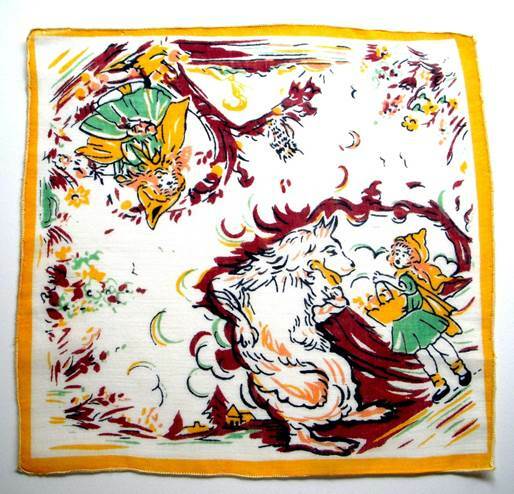 Again, so much artistic effort for a simple child’s handkerchief, it’s simply lovely. 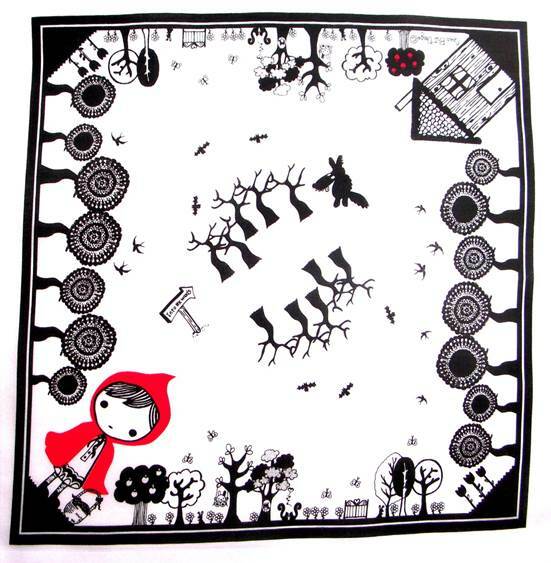 This contemporary hankie sports the modern Goth version of Red Riding Hood in which Red commands a bird’s eye view of the scene, courtesy of Google Earth accessed from her ipad. There’s Big Bad hiding in the forest. Red knows that taking the oh-so-tempting shortcut through the woods will put her directly into his clutches. Note how the birds morph into menacing bats. Yikes! Wolfman will be flossing bits of Ms. Hood from his choppers, while swilling her wine. Best to tiptoe round the botanical border if she ever hopes to make it to granny’s. Note the attention to detail with the teensy bunny on the swing, (including his even teensier foot pads) alongside the mating squirrels. 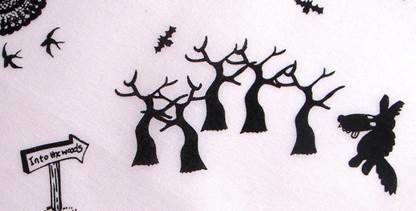 Each tree is a unique species. Red is reserved for our heroine and the apple tree snuggled safely next to to granny’s cottage. If Ms. Hood can make it to granny’s, there’s probably a warm apple pie waiting. The artist spared no detail. What a clever a mini canvas for the creative spirit. Charles Perrault explained the ‘moral’ of the cautionary tale to remove any doubt as to its meaning: “From this story one learns that children, especially young lasses, pretty, courteous and well-bred, do very wrong to listen to strangers, and it is not an unheard thing if the Wolf is thereby provided with his dinner. I say Wolf, for all wolves are not of the same sort; there is one kind with an amenable disposition – neither noisy, nor hateful, nor angry, but tame, obliging and gentle, following the young maids in the streets, even into their homes. Alas! Who does not know that these gentle wolves are of all such creatures the most dangerous!” Take note, Perrault wrote this in 1697!